The Vail Valley offers an escape for every type of backcountry wanderer. Whether your goal is bagging a peak, trekking to a high-alpine lake, exercising Rover, or conversing with a babbling creek, an endless summer of happy trails awaits. Wolcott sculptor Paul Wertin thrives when working conditions are at their harshest. A pair of Avon chefs import haute cuisine without the haughty. Sports experts say flexing your muscles pre-workout may do more harm than good. A dynamic design/build power couple from Vail apply what they learned about high-end, high-rise living to a (relatively) modest single-family home with compelling results. 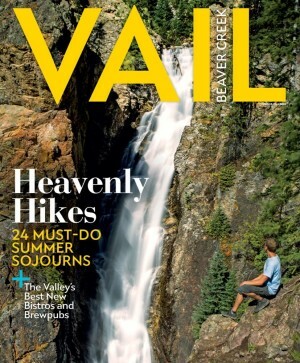 Why Vail’s marketing gurus are trusting a blogger from Brooklyn with the keys to our valley. Whether your inspiration’s Vader, Arya, or Olympic gold medalist Mariel Zagunis, this club’s for you. If you love single track, Eagle's one of the best spots in the county—and even the state—to get your fix. The story of how a plucky Eagle nonprofit introduced mountain biking to the valley’s Hispanic community—and created a team of state champs that’s charging uphill toward the future. Hiking in the mountains requires a few extra considerations. Before setting out, especially on the valley’s most challenging trails, take these factors into account. Trails for those who like a mission when they go hiking. Vail and Beaver Creek aren’t just for skiing — it’s time to break out the hiking boots and hit the best resort trails. After twelve seasons representing the U.S. at the world championships, a white-water legend Retires his paddle. Enjoy great deals on greens fees and lodging. Hip clothing that combines function and fashion for cyclists and hikers.